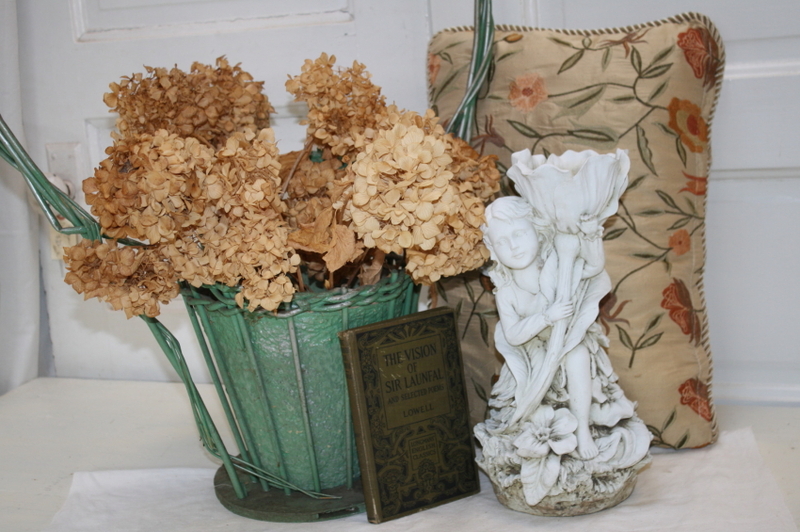 garden accent pieces | Cape May Antiques Inc.
Take Your Garden Statues Indoors! I really dislike the fact that summer is officially over, but it allows me to take my decorating inside again and one of my favorite decorating ideas is to take my garden statues inside to create an enchanting vignette! 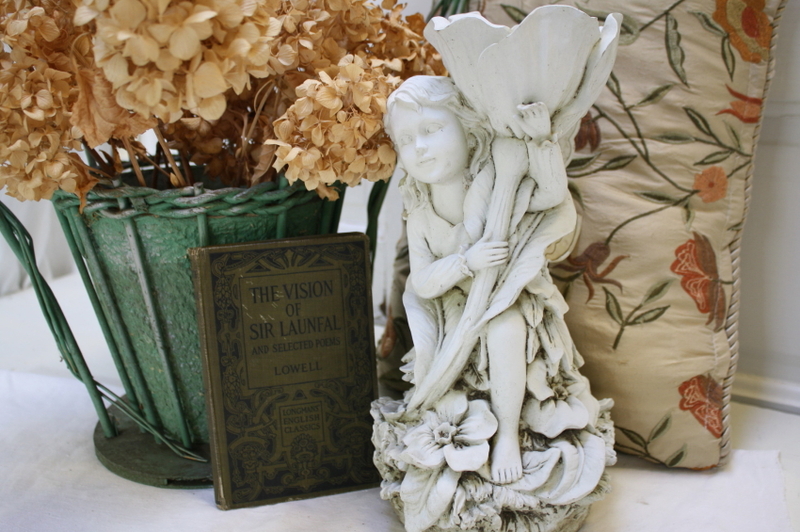 This lovely cherub girl adorned with flowers at her feet and holding a small bird bath or feeder in the large flower, was taken into my shop from my overgrown flower garden just yesterday. I want to keep her safe from the fall freeze and she adds a delightful center piece for my fall vignette. I have an antique funeral basket (the tall green basket with silver accents) that I filled with fresh cut hydrangeas from our hydrangea bushes that line the brick walkway to our store. For a soft touch, I added a silk tapestry vintage pillow with the most amazing fall shades! Finally, not complete until an antique book with a dark green cover was added to tie in the relaxation element of the vignette. Yes, I created this for my vintage store, but you can do the same in your own home! Think about changing up an entrance or foyer table. Even a nice long server or buffet in your dining area would be a great place to house your summer garden accent pieces after a good cleaning and protective pads added to their bottoms so you don’t scratch your good furniture! Gee I sound like my Mom! Well, I hope I have inspired you to change it up a bit by using garden statues or other garden elements to decorate your home!